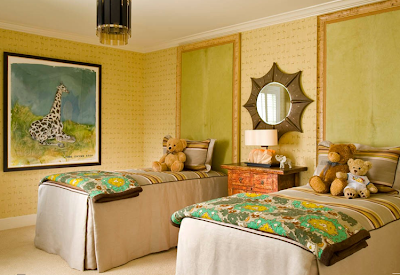 A good friend of mine (and fellow interior designer), Jennifer Kostohryz, in Fort Worth forwarded me the link to a designer in Dallas - Laura Lee Clark - who has some wonderful children's rooms in her portfolio. These rooms are large (Texas style), so there is a lot of room to play with extra seating and oversized decor. Laura seems to love to use wallpaper (a girl after my own heart), and her custom lucite-accent pieces are spectacular. A boy's room with a subdued safari theme. Lots of lucite in this teen bedroom. How much fun is the fur & lucite ottoman and the wallpaper framed behind lucite panels? A similar feeling the the purple room below. A full daybed serves as a place to sleep as well as a place to entertain and gossip with your friends. I mean who would not want that leather ottoman with the spade nailhead design? Sheridan this room has your name all over it! That ottoman is knockout!! I was swooning over it before I even saw your comment. I love the special shelves for the Madame Alexander dolls also. And don't even get me started on framing the wallpaper with lucite. Girl has some ideas! !